The document provides good practices and guidance for educators how to use the collaboration environment and how to embed and use it in their own context. The document furthermore gives recommendations on how to introduce an Open Educational Ideas and Innovation approach in learning and teaching (programmes). This document discusses educational idea sharing and ways to build emotional ownership of the ideas. Readers will also find the approach of the Open Educational Ideas initiative explained, which has been developed based on barriers to the uptake of open educational resources. The report explains some of the key considerations and conditions for successful idea sharing. section describing how OEI2 supports current EU policies. 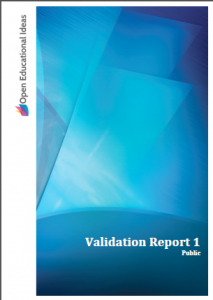 The report contains the knowledge gathered in “Open educational idea” workshops (awareness workshops, participants with diverse backgrounds) and interviews with OER experts on our methodology. You find insights on how educators share material and ideas, with whom and where. Furthermore, the document contains information which elemtents educators find important to make the OEI approach successful. Authors: Markus Bick and Safa’a AbuJarour, ESCP Europe Wirtschaftshochschule Berlin e.V. This report is linked to the technical development of the idea sharing platform. Several focus groups and user observations testing the alpha version yielded a longer list of improvement suggestions and positive feedback. We present outcomes in this document. The document reports on the second stage and final trials of the collaborative platform Idea Space. The platform contains integrated tools and features and was considerably updated after initial validation and a shortlist of the major aspects to be improved as suggested by the users. Based on the feedback of the validation phase 1 the concepts of emotional ownership and OEI were further developed and tools were refined.